The Writers' Lens: The Winner of the Shades of Fury Giveaway! Congratulations Twistingthelens, you have won the Shades of Fury Giveaway! You will receive a copy of Red Hot Fury, Green-Eyed Envy, and the latest release Blackhearted Betrayal! 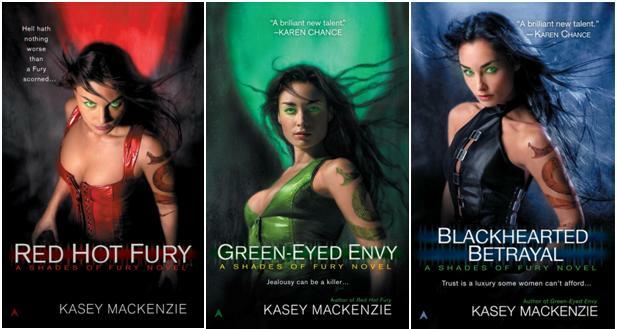 The entire Shades of Fury series by Kasey Mackenzie! My apologies to Mrs. Mackenzie, and Twistingthelens, the winner of the giveaway. I thought I had announced the winner, but I have been planning a writers conference plus all my other work and I forgot to post the winning announcement. Yet again, my apologies, and I assure you I will strive to schedule the posts so this does not happen again.